DVD 52 Minutes NTSC (will play on international DVD players) / $18.95 plus $5 s/h (order as many items as you like for one flat shipping charge). Please write or e-mail us for further information. T-shirt "LIVE WITHIN EARTH'S MEANS!" Free-Will Productions' on-going campaign for environmental ethic and common sense (see SHOWS page) is now exemplified by this organic, made-in-the-USA T-shirt: FRONT: "LIVE WITHIN EARTH'S MEANS!" - BACK: "LOVE - REDUCE - SHARE - RESPECT - RE-USE - CONSERVE - RECYCLE" is the foliage of a tree with roots that read "BELONGING". Available in men or women's cut and in green, navy blue, black, red and slate. S-M-L-XL-XXL sizes are on the small side. Ladies must order one size larger. Please indicate your preferences in the "Special Instructions" area of your order. / $18.95 plus $5 s/h (order as many items as you like for one flat shipping charge). 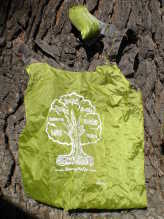 "ChicoBag" Re-useable folding shopping bag made of 99 % recycled material. Folded, reads: LIVE WITHIN EARTH MEANS ! Open, displays same tree design as T-shirts. Bi-color: green and brown. $6 plus $5 s/h (order as many items as you like for one flat shipping charge). DVD 93 Minutes NTSC (will play on international DVD players) / $18.95 plus $5 s/h (order as many items as you like for one flat shipping charge). VHS 93 Minutes NTSC for North America / $18.95 plus $5 s/h (order as many items as you like for one flat shipping charge). Full printed transcript / $30 plus $5 s/h (order as many items as you like for one flat shipping charge). DVD 64 Minutes NTSC (will play on international DVD players) / $18.95 plus $5 s/h (order as many items as you like for one flat shipping charge). VHS 64 Minutes NTSC for North America / $18.95 plus $5 s/h (order as many items as you like for one flat shipping charge). DVD 8-1/2 hour compilation of interviews / $49.95 plus $5 s/h (order as many items as you like for one flat shipping charge). Original Soundtrack by Fritz Heede (CD) / $10 plus $5 s/h (order as many items as you like for one flat shipping charge). DVD 57 Minutes NTSC (will play on international DVD players) / $18.95 plus $5 s/h (order as many items as you like for one flat shipping charge). This title plays in both English and Spanish on the same disk and includes an additional hour of bonus interviews. VHS 57 Minutes NTSC for North America / $18.95 plus $5 s/h (order as many items as you like for one flat shipping charge). The VHS version of this title is presently available in English only -- Spanish version coming soon. If you would like the Spanish version sooner, please consider ordering a DVD. VHS 5-hour compilation of English interviews - NTSC for North America / $49.95 plus $5 s/h (order as many items as you like for one flat shipping charge). VHS 6-hour compilation of Spanish interviews - NTSC for North America / $49.95 plus $5 s/h (order as many items as you like for one flat shipping charge). VHS 52 Minutes NTSC for North America / $18.95 plus $5 s/h (order as many items as you like for one flat shipping charge).